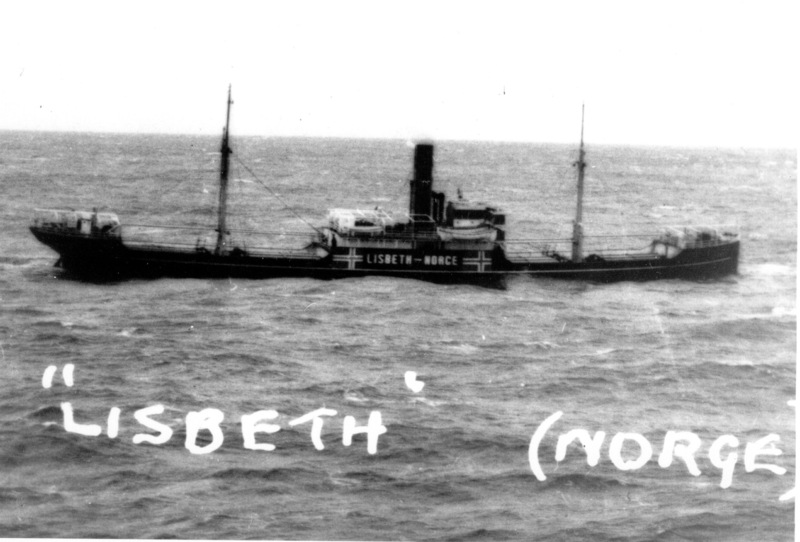 The Lisbeth arrived in Seville on January 3, 1944 to load a cargo of oranges. On January 7, at 15.00 hours she left Seville for Gibraltar with five airmen hidden in the ship’s propeller shaft compartment: Tom Applewhite, Stan Munns, Thelma “Jockey” Wiggins, Elton Kevil, and John K. Hurst. At 20.15 hours on the same day, the ship anchored at the mouth of the Rio Guadalquivir and stayed there until January 10. She arrived in Gibraltar on January 11, 1944 at 6.45. The members of the crew were as listed below. In addition to rank and name, each man’s date and place of birth and nationality is given. There is the possibility of misspellings in some names and places of birth. I would like correspond with any members of the crew still living or members of their families. I am fortunate to have been able to talk at length with Bill Bettinson, 3rd Radio Operator, and correspond with Captain Apeland’s son. For my interview with Bill Bettinson, click here. Master – Einar Apeland, 1/1/12, Haugesund. Norwegian. 1st Officer – Jens Aksdal, 13/3/05, Etne. Norwegian. 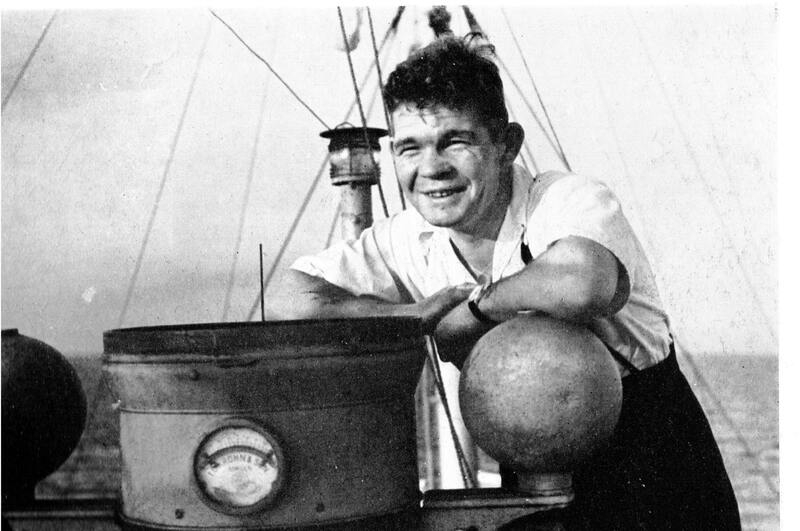 2nd Officer – Roald Larsen, 3/6/16, Haugesund. Norwegian. 3rd Officer – Olav E. Angel, 16/9/20, Sjervo. Norwegian. 1st Radio Officer – Ambrose J. Tai, 23/7/20, Sandaken, B. N. Borneo. Chinese. 2nd Radio Officer – Arvid Kragstad, 2/8/14, Honefoss. Norwegian. 3rd Radio Officer – Laurence W. “Bill” Bettinson, 24/7/25, Fleet Lincs. British. Boatswain – Odd Hansen, 31/10/16, Tjolling. Norwegian. Able Bodied Seaman – Hans Pettersen, 8/1/14, Halden. Norwegian. Able Bodied Seaman – Eugen Medalen, 13/5/19, Sketfoss. Norwegian. 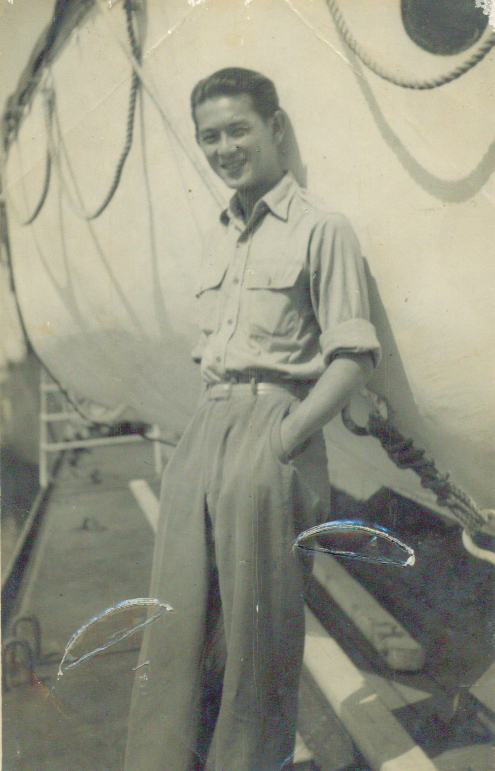 Able Bodied Seaman – Sigmund Stenersen, 22 (28? )/6/19, Fosnavog. Norwegian. Able Bodied Seaman – Johannes Nenningsland, 12/11/20 – Lyngdal. Norwegian. Able Bodied Seaman – Daniel McDonald, 19/7/24, Holyhead. British. Able Bodied Seaman – George Jeffries, 15/10/22, Wallasey. British. Able Bodied Seaman – Odd Myking, 22/12/20, Bergen. Norwegian. Able Bodied Seaman – Knut Siren, 12/1/21, Sandefjord. Norwegian. 1st Engineer – Joachim Kvinge, 14/9/88, Bergen. Norwegian. 2nd Engineer – Johan Gulliksen, 12/12/11, Porsgrunn. Norwegian. 3rd Engineer – Olav Kaasa, 1/2/14, Stokke. Norwegian. Donkeyman – Johannes Johanessen, 31/7/01, Tromso. Norwegian. Greaser – Leif Jorgensen, 5/2/18, Sannidal. Norwegian. Greaser – Rolf Reuterdahl, 11/6/03, Oslo. Norwegian. Fireman – Johan Johansen, 27/8/05, Tonsberg. Norwegian. Fireman – Hans Christensen, 22/4/19, Drammen. Norwegian. Fireman – Lief Ramberg, 12/1/15, Sorriesa. Norwegian. Fireman – Kriss Grundbergs, 11/2/10, Vallaikie. Latvian. Fireman – Fricis Juanarais, 6/8/07, Riga. Latvian. Fireman – Ingar Larsen, 15/9/11, Oslo. Norwegian. Trimmer – Leif Gaupseth, 11/7/19, Alesund. Norwegian. Steward – Bjarne Larsen, 15/6/13, Stokke. Norwegian. Chief Cook – Lars Torkildsen, 20/7/18, Kvinnesdal. Norwegian. 2nd Cook – Rosslyne Hadsrup, 12/12/24, Cardiff. British. Saloon Boy – Orlando Wild, 30/9/25, Oldham. British. *The ship’s roster has a notation that O’Connor was deceased.